so I'm weird and picky about random things, like bobby pins. maybe its because of my time in beauty school, but the drug store kind doesn't cut it. I prefer the professional kind. But, since these are professional they only come in 1 lb increments, meaning 400 bobby pins per pound. I just ordered a box. 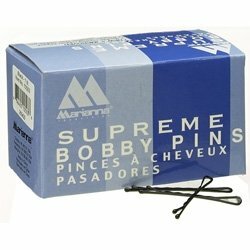 So, if you need brown bobby pins, you know a girl. This is good to know, as someday, I hope to be the kind of girl that needs bobby pins. Yes, please. I have about a million in my hair right now. I'd only need half that if I had the pro kind! shiv- when i get home, i'll give you a bunch!